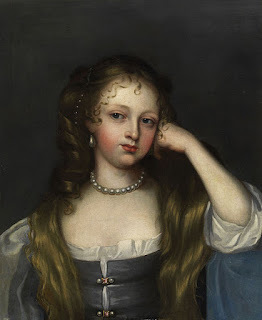 2nd February 1650 saw the birth of one of the more engaging characters of 17th century England, namely Nell Gwyn, who was for 17 years the favourite mistress of King Charles II. Nell Gwyn was born in a London brothel, the daughter of its keeper, and as a young child she served brandy to the brothel’s clients. The brothel was close to the famous theatre in Drury Lane, which re-opened when King Charles II was restored to the throne in 1660. At one time Nell sold oranges outside the theatre and then she decided to try her luck as an actress. She supplemented her income, as did many actresses at the time, by sleeping with the theatre’s more wealthy patrons, and this was how she came to the attention of King Charles. She was 19 at the time and the king was 39. It was not long before she was firmly on the royal payroll of mistresses. One thing in her favour as a mistress was that she had no interest at all in matters of state and had no wish to meddle in them. Also, once established as the king’s favourite she was genuinely loyal to him so there was no danger that she would make indiscreet “pillow talk” remarks to another lover. She was well treated by Charles, but did not make any monetary demands of him – another reason for her longevity as a bedroom companion, during which she bore Charles two sons. Despite her lowly background and lack of education Nell Gwyn definitely had her wits about her – on one occasion she was mistaken for another of Charles’s mistresses, the Catholic Louise de Kéroualle. An anti-Catholic mob approached her carriage, iron bars in hand, but Nell had the presence of mind to show her face and say: “Please be civil, for I am the Protestant whore”. When King Charles died in 1685 he famously asked his brother James, “Let not poor Nelly starve”. James may have been an unpleasant piece of work in many respects but at least he honoured this pledge by allowing Nell Gwyn a pension of £1,500 a year (the equivalent of millions today). Unfortunately, Nell Gwyn did not have long to enjoy this wealth, because she died of a stroke only two years later, at the age of 37.